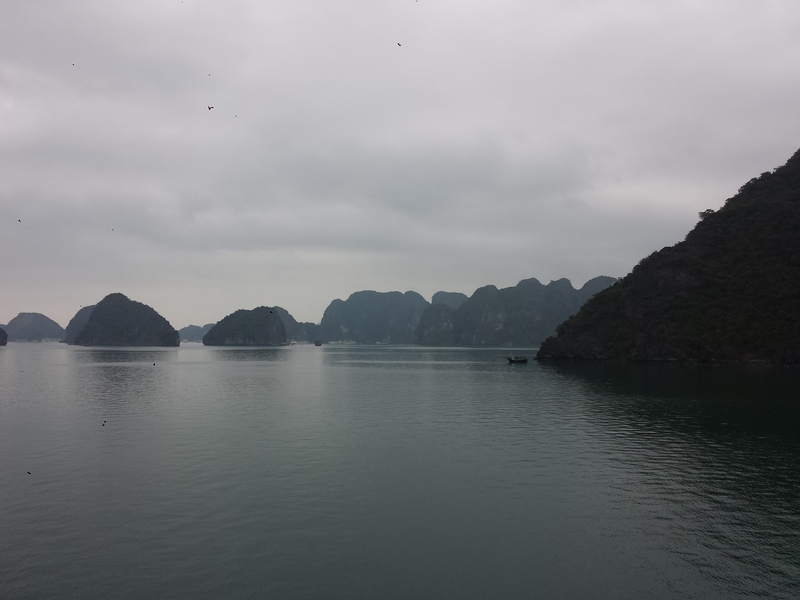 A trip to Vietnam would not be complete if you didnt take the opportunity to explore the famous Ha Long Bay! I booked the tour in my hotel but it was very expensive! 199 dollars for a two days one night trip!!! After enjoying breakfast the shuttle picked me up in front of my hotel on wednesday 🙂 As a passive pedestrian you have to fight very hard in order to survive between the movements of thousands of vehicles but as an active participant you have to fight even harder so I think I dont need to tell you that it was an adventurous ride from Hanoi to Ha Long bay 🙂 It was just completely off the wall! We passed beautiful ricefields and small villages while people were driving like they had gone mad! In Vietnam there seems to be no rule to drive either on the left or in the right side of the street the only thing that emerged on on my ride was that every tiny space was used 🙂 Nevertheless it took us 4 hours to drive a distance of about 150 km! 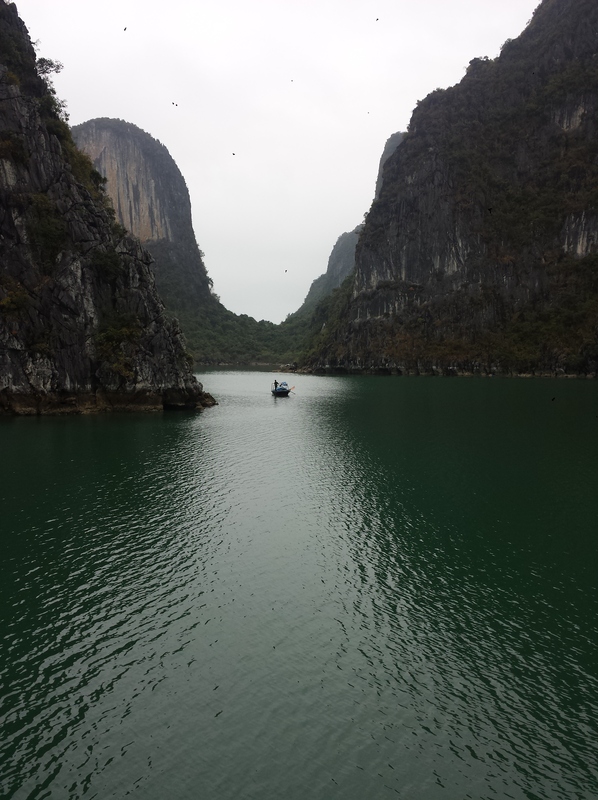 Almost evey boat driving through Ha Long bay has full board or all inclusive! The lunch had been great good fresh seafood and vegetables grown at an organic farm near Ha Long bay! 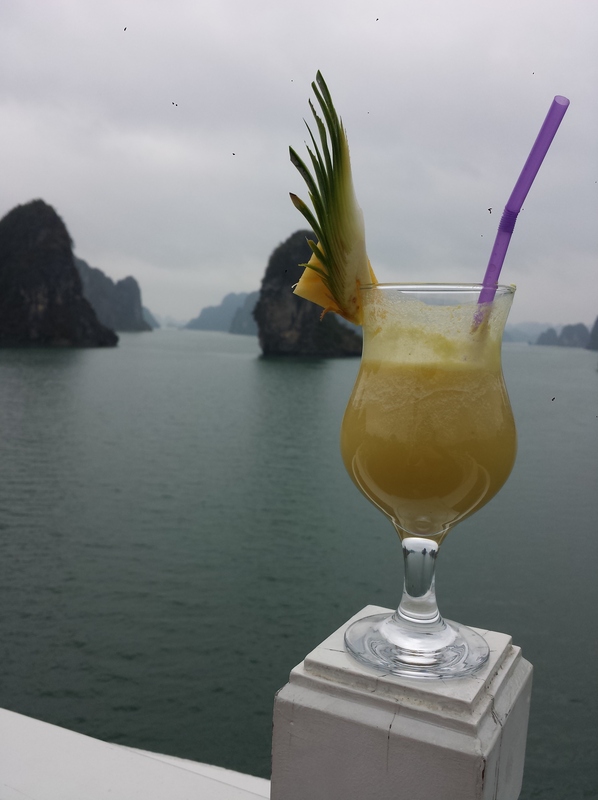 After having eaten too much I ordered a cocktail and went to the boats sun deck where I clambered onto the rail 😆 Sitting there with a fresh mixed pina colada I could enjoy a great view! A gentle sea breeze caressed my skin and I felt absolutely free 😃 Nobody was there but me! The only sound came from the boats roaring engine! I closed my eyes for a moment when I suddenly noticed this disgusting smell! I opened my eyes and saw that there was waste everywhere in the water! Toothbrushes glassbottles and even tires were floating scattered in the water! I closed my eyes again and hold my breath! 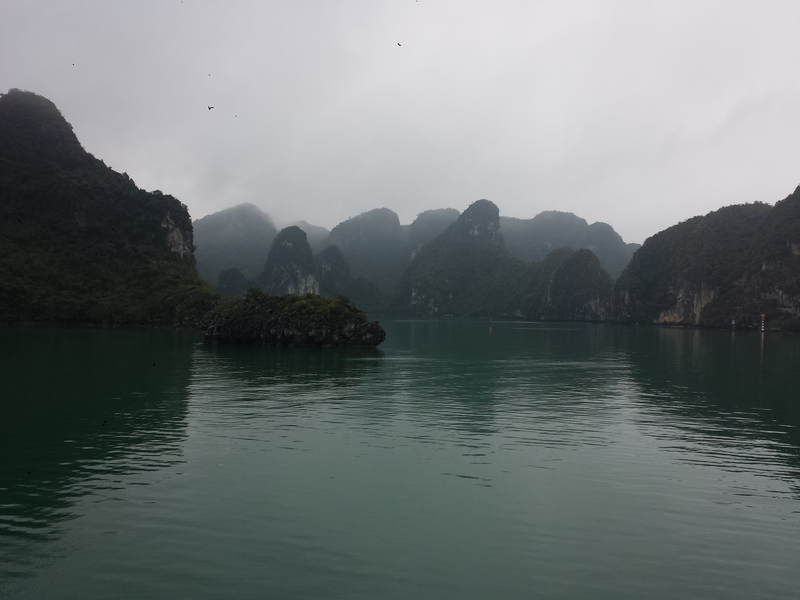 Except the garbage problem Ha Long bay is really beautiful 🙂 Ha Long means descending dragon and in fact the limestones are looking like the back of a dragon diving into the water! Every stone is different in size and shape 🙂 They are scattered all over the bay! Its amazing! Some of these rock formations are very huge shooting into the sky like timeless statues others are small looking like fisherboats floating somewhere far away waiting for a good catch! 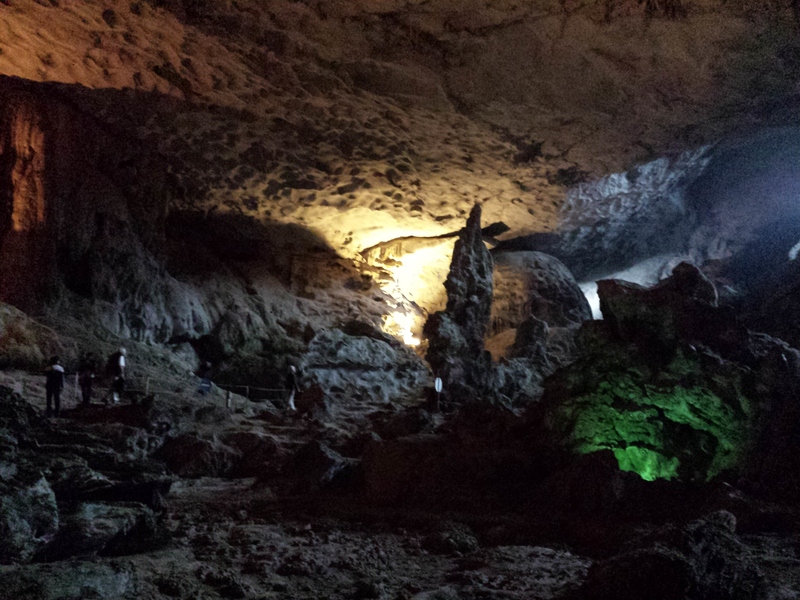 I fantasized about a live on the ocean when the engines stopped roaring time had come to visit one of the caves inside the limestone formations! I postponed dreaming on to a later date and went to the shuttle boat! On the way to the caves entry we passed a small floating village and many people who tried to sell stuff like chips and soft drinks by boat! 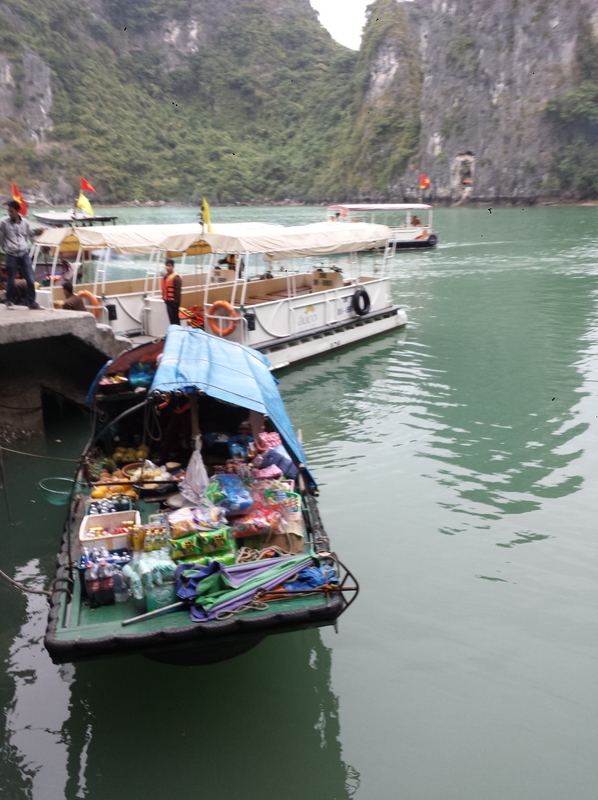 Yes its usual at Ha Long bay that people are trying to sell something by boat! nice, this place is on my list! Admire yr courage in setting out alone.